[151 Pages Report] The global generator sales market was valued at USD 19.92 Billion in 2017 and is projected to reach USD 27.24 Billion by 2023, at a CAGR of 5.41%, during the forecast period. This research study involved the use of extensive secondary sources, directories, journals on energy storage, and other related reports, newsletters, and databases such as Hoover’s, Bloomberg, Businessweek, and Factiva to identify and collect information useful for a technical, market-oriented, and commercial study of the global generator sales market. The primary sources include several industry experts from the core and related industries, vendors, preferred suppliers, technology developers, alliances, and organizations related to all the segments of this industry’s value chain. The research methodology has been explained below. After arriving at the overall market size, the total market was split into several segments and sub-segments. The figure below illustrates the breakdown of primary interviews conducted during the research study on the basis of company type, designation, and region. The leading players in the generator sales market include Caterpillar (US), Cummins (US), Rolls-Royce (UK), Mitsubishi (Japan), Yanmar (Japan), and Kohler (US). 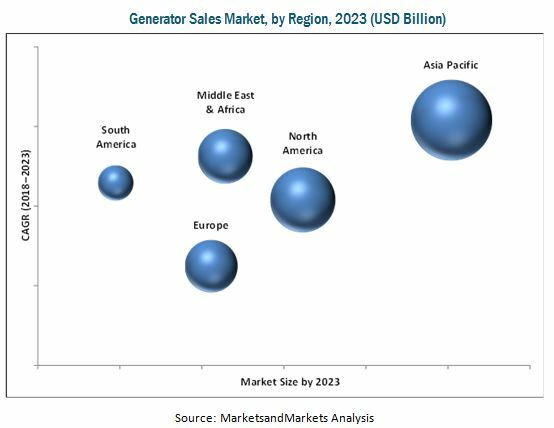 The generator sales market is estimated to be USD 20.93 Billion in 2018 and is projected to grow at a CAGR of 5.41%, during the forecast period, to reach a market size of USD 27.24 Billion by 2023. The growth of the generator sales market can be attributed to the increasing demand for uninterrupted and reliable power from a wide range of end-users such as the residential, IT/Telecom, healthcare, utility and power generation, marine, chemicals, oil & gas, mining, and construction sectors. The report segments the generator sales market on the basis of fuel type into diesel, gas, and other fuel generators. Diesel generator sets are widely used in the manufacturing, healthcare, oil & gas, marine, and IT/telecom sectors due to the easy availability of fuel, ease of storage, ease of transportation, spare parts, and quick response to load changes. These factors are expected to lead to the diesel generator segment being the largest during the forecast period. However, to reduce emissions, developed countries such as the US, Canada, the UK, Germany, France, the Netherlands, and Japan are rapidly adopting natural gas-based power generation technologies due to which the gas generators sales market is expected to grow at a faster pace during the forecast period. The generator sales market has been segmented based on end-user into residential, commercial, and industrial. The industrial end-user segment is expected to grow at the highest CAGR during the forecast period. The key factor driving the market is the favorable government policies for the growth of industries in various countries such as Mexico, China, Brazil, and India. The growth of the oil & gas sector in China, Mexico, Canada, and African countries is also fueling the demand for generators in the industrial end-user segment. On the basis of power rating, the generator sales market has been segmented into 100 kVA, 100–350 kVA, 350–1,000 kVA, and above 1,000 kVA. The above 1,000 kVA segment is expected to be the fastest-growing market during the forecast period. Above 1,000 kVA generators find application in a wide range of end-use industries for prime and continuous power supply. The increasing use of natural gas for the above 1,000 kVA generators is also expected to fuel the growth of the market. Asia Pacific is expected to be the largest and fastest-growing market due to the high demand for power products in China and India. The high economic growth rate of China has led to an increase in the demand for power generation equipment such as diesel and gas generators in the country. New policy reforms in India to support the growth of industries have made the country a very lucrative market for OEM manufacturers. This is also likely to create a huge demand for generators in the region. The major factors restraining the growth of the generator sales market are the increased adoption of energy storage technologies and significant investments in modernizing/upgrading existing T&D infrastructure. Stringent government regulations for diesel-powered generators along with high operational and maintenance costs are one of the major challenges in the generator sales market. Some of the major players in the generator sales market are Caterpillar (US), Cummins (US), Rolls-Royce (UK), Mitsubishi (Japan), Yanmar (Japan), and Kohler (US). These players have adopted growth strategies such as new product launches, contracts & agreements, mergers & acquisitions, and expansions to capture a larger share of the generator sales market.